TV broadcasters and investors are ready to bask in what looks to be a bloody -- and profitable -- election. But which broadcasters stand to gain the most? Negative political ads may not be good for society and democracy, but it's good business for the media -- and local TV station owners in particular. For the broadcasters, who are squeezed between streaming video providers and cable companies, the presidential election cycle is a quadrennial gift that provides cash to reduce debt, pay dividends and fund acquisitions. "It has become increasingly important because, for one, political advertising is now over 10% or 12% of average revenue and its growing fast," said Moody's Investors Service analyst Carl Salas of political ad spending, adding, "it's highly profitable." During times of peak demand, stations can sell political ads for 40 to 50 times more than the rates for the run of the mill car ad, making political spots disproportionately valuable. The 2016 campaign is set break records, and not just because of the polarizing candidates. This election is the first-ever without an incumbent president in which the parties are freed from the financial restrictions eliminated with the Supreme Court's 2010 Citizens United decision. The landmark ruling allows corporations and unions to spend as much as they please to support, or defeat, candidates. And with the Senate and the Supreme Court in the balance, too, spending is set to hit record levels. Some $11.7 billion is projected by ad tracking firm Borrell Associates to be spent in the 2016 election cycle. Overall advertising volume is already tracking at 122% over 2012 levels, with an estimated $408 million having already been spent on TV ads in the presidential race alone. 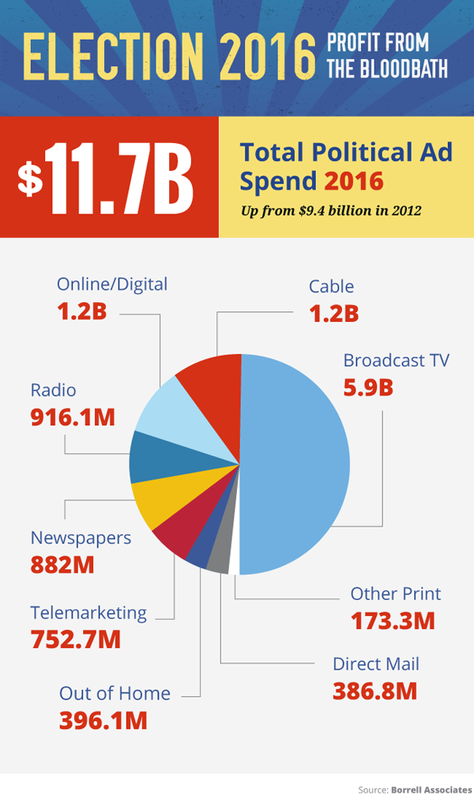 Digital ad spend is expected to reach $1 billion for the first time ever, but the bulk of that $11.7 billion -- $5.9 billion -- is projected to go to local broadcast television. Others have called for broadcast TV political revenues of $3.4 billion to $4 billion, which would still set a record. CBS (CBS - Get Report) Chairman and CEO heralded the upcoming political season during a May earnings call. "Clearly, there are a lot of fireworks yet to come," he said, "and with those fireworks will come more revenue. " While CBS, Comcast (CMCSA - Get Report) 's NBCUniversal and Telemundo and the ABC division of Disney (DIS - Get Report) can expect a political pay day, the companies with the greatest proportional exposure to the include local television station groups such as E.W. Scripps (SSP - Get Report) and Gray Television (GTN - Get Report) that have important station assets in swing states and in areas with hotly contested local elections. Fellow broadcaster Nexstar (NXST - Get Report) is roughly tripling its political exposure with its $4.6 billion acquisition of Media General (MEG . Spanish language radio, TV and digital media group Entravision (EVC - Get Report) represents a direct play on the Latino market, which will be a pivotal given its size and some of Trump's remarks about Mexicans. "Clearly it's been a very different political environment this year," said Television Bureau of Advertising CEO Steve Lanzano, who expects a more modest $3.3 billion-to-$3.6 billion of political advertising on TV, up from $2.9 billion in 2012. The primaries have already made for a stronger-than-expected first quarter. And while the first quarter topped expectations, the bulk of the spending comes in the latter half of the year, with the floodgates opening in October and early November. Though Trump has benefited $3.4 billion or so in earned media, or free coverage, according to media measurement firm mediaQuant, Lanzano expects the candidate to start spending. "Now he has to reach a broader electorate, and advertising is going to have to play a key role in that if he wants to win the election," he said. The Television Bureau forecasts that Trump and Clinton campaigns to spend about $1 billion each on ads. Some of it is simple math based on the amounts that parties have raised, but psychology and ego are also factors. "I don't think the Clintons want to be known as the ones who lost to Donald Trump, so they are going to spend a lot of money," Lanzano said. "Donald Trump responds to every attack, so he is going to spend money." But not all local TV broadcasters are created equal when it comes from being in a position to capitalize on the spending bonanza. Marci Ryvicker of Wells Fargo tracks exposure to the hottest races through a complicated formula that includes ABC, CBS, Fox and NBC stations in contested markets and assigns weight for for Senate, House, gubernatorial and presidential races. Here's how they break down. The broadcaster, which operates 34 stations in 17 states, gets the top marks, with exposure to 56% of the hottest races, Ryvicker's report says. The portfolio includes ABC affiliates in battleground markets Cincinnati and Tampa, and the NBC station in West Palm Beach, Fla. The Cincinnati media group merged with Journal Communications and spun off its newspapers last year, increasing its exposure to political spending in Arizona, Florida, Michigan, Nevada and Wisconsin. Wells Fargo projects that the group will generate $167 million in 2016 political ad sales, up from $143 million in 2012. Scripps booked more than $9 million in political revenue in the first quarter, with stations in Florida, Michigan, Nevada, Ohio and Wisconsin making important contributions. The company expects more than $150 million in political sales for the entire year, which looks conservative compared to Wells Fargo's projections. Gray, which operates 64 stations in 27 states, scores 35%, with Wells Fargo projecting $149 million in political revenue. The company substantially expanded its exposure to races through the roughly $440 million purchase of Schurz Communications earlier this year. Gray has the first- or second-ranked station in 49 of its 50 markets, increasing its appeal to campaigns. "If Gray TV were in a market and had the No. 1 news, which it typically does, they could sell that for 40 times or more than the core car ad or retail ad when demand peaks," Moody's analyst Salas said. So if a core television ad goes for $1,000, a political ad at the highest levels of demand could go for more than $40,000. The company has stations in presidential swing states Florida, Colorado, Iowa, Nevada, Ohio, Virginia and Wisconsin. It broadcasts to electorates in 9 of the competitive Senate races, 11 of the close House races and 10 gubernatorial races. Tegna is the former TV unit of USA Today publisher Gannett (GCI - Get Report) and owns or operates 46 in 23 states, exposure to 34% of the hot races, by Ryvicker's account. Wells Fargo expects political revenues to grow from $197 million in 2012 to $205 million. Sinclair Broadcasting has the highest projected political advertising revenue, a jump from $254 million in 2012 to $275 million this cycle. Though poised to collect a large sum in absolute dollars, Wells Fargo puts Sinclair's exposure to the hot races at a comparably low 20%. The company owns about 170 stations in 39 states, including ABC and Fox affiliates in Columbus, Ohio, and the Pittsburgh Fox station. Sinclair said in its May earnings call that $24 million in first-quarter political revenue was 2.5-times the same period in 2012. Irving, Texas-based Nexstar is poised to leapfrog Sinclair, once its purchase of Media General closes. Wells Fargo expects Nexstar to generate $115 million in 2016 political advertising, while Media General looks to sell $183 million in political ad space. The merger partners have said they will have 171 stations reaching 39% of the country, but have not disclosed a final list of stations and markets. Media General, which scores a 28% exposure rating from Wells Fargo, owns a MyNetwork affiliate in Tampa and has an NBC station in Columbus, Ohio. Nexstar, with a 27% rating from Wells Fargo, owns an NBC station in Wilkes-Barre, Pa., and operates the CBS station in the market. In Green Bay, Wisc., Nexstar owns the CBS affiliate. Chicago broadcaster Tribune has just a 9% exposure to the hot races, according to Wells Fargo. Still, it projects $200 million in 2016 political revenues, which is more bullish than the $170 million that Wells Fargo forecasts. The company sold $166 million in 2012 political ad space. Tribune doubled down on television since the last presidential election by purchasing Local TV Holdings for $2.725 billion in late 2013, and spinning off its newspaper division early the following year. The appropriately named Local TV Holdings owned 19 television stations in cities such as Denver, Cleveland, St. Louis, Kansas City, Salt Lake City and Milwaukee. Most of the stations were Nos. 1 or 2 in their respective markets. "When we bought local TV a couple of years ago, one of the reasons we felt so good about that acquisition was the political footprint that came with it," Tribune Chief Strategy Officer Eddie Lazarus told investors during a May investor call. He touted the Fox stations in Milwaukee and Cleveland, the latter of which generated $30 million in 2012 political advertising. If Trump were to win, Lazarus said during the May call, Tribune's "upper mid-west tier of states is going to become the fulcrum of the election." To win the White House, Trump will need more than the Mid West. While his brash style played well in Republican primaries, Trump's comments on Hispanics and other demographics could cost him in the general election. "The Republican party and the candidates are aware that they need the Latino electorate to win the White House," said Mario Carrera, chief revenue officer for Spanish-language television, radio and digital media group Entravision. Mitt Romney, who received just 27% of the Latino vote versus George W. Bush's 44%, illustrates the point. Trump has particularly antagonized Mexican businessmen, politicians and others. "When Mexico sends its people, they're not sending their best," he said in a 2015 speech, adding that immigrants included criminals and rapists. Trump clashed with Comcast's NBC and Univision, barring employees of the latter from his Trump National Doral golf course in Miami. Former Mexican President Vicente Fox said on CNN that Trump reminds him of Hitler. "You can't win with the white male vote," Entravision CFO Chris Young said. "Mitt Romney couldn't do it. Reagan could pull it off in the 80's but this is a different era." Entravision grew political revenue from $8.1 million in 2008 to $16.6 million in 2012, a gain of 105%. This is its first Presidential cycle with meaningful digital revenue. First-quarter political revenue of $1 million was 10 times the company's take from the same period in 2012. The company anticipates that political spending for 2016 will grow 30% from the last cycling, to about $21.6 million. "There is more and more interest and understanding of the local value of the Latino electorate, especially in the key Entravision battleground states like Colorado, Nevada, Florida and Virginia," Carrera said. Critical markets for Entravision include Denver, Colorado Springs, Las Vegas, Reno, Calif; Tampa, Orlando and Washington D.C.
"Denver in particular has been rather strong in the third and fourth quarters," Carrera said. Senate and primary races have driven results in California, he said, the National Rifle Association recently purchased inventory in Las Vegas. Advertisers have been more aggressive in buying time in the third and fourth quarters than in previous cycles. "They don't want to be surprised by being left out and having to compete for the inventory and certainly pay a much higher rate," Carrera said. "We've seen that crunch in 2012." Generally speaking, the Moody's analyst Salas said, 50% of the political ad money to media companies comes in the first five to six weeks of the fourth quarter. As TV time becomes more scarce, advertisers will likely lean more toward digital, radio and other outlets. Some of the political windfall will go to shareholders. Entravision CFO Young said the company generally returns a third of its free cash flow to shareholders via dividends, uses a third to repay debt and devotes the remaining third to acquisitions. Others are likely to share the spoils. "Some of these guys if they are comfortable with their leverage I could see them doing special distributions," Salas said, referring to special dividends companies might pay shareholders if the political windfall is strong enough. "We saw that in 2012 and 2014." A. H. Belo, which merged its TV operations with Tegna; Local TV, which is now part of Tribune; Entravision and Sinclair paid dividends following the last election, he noted. Whatever the outcome of the election, there will be sore losers. TV investors, at least, can console themselves with some extra cash. While the next political payday comes in two years, with the midterm elections, investors cannot assume that television will always command the political advertising market. Social media and other digital outlets are taking an increasingly large share and the media world may look much different in 2018 and 2020. According to the Borrell Associates data, spending on digital is expected to triple in the 2020 election to $3.3 billion, with social media driving the increase by nearly quadrupling to over $2 billion. Meanwhile, local broadcast spending is expected to fall by more than a billion dollars to $4.7 billion. If Les Moonves is correct, broadcasters are in for a five-month fireworks show. They should not get complacent, though. The pyrotechnics end on election day, and they may not shine as brightly in future elections.